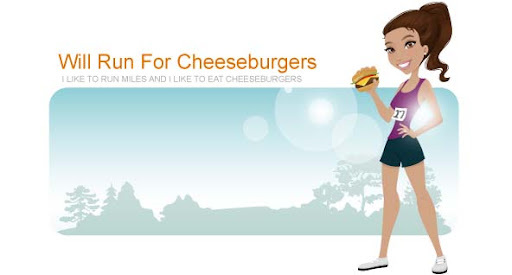 Will Run for Cheeseburgers: Penguin overboard! The weather in Charlotte has been gorgeous lately! Instead of doing my daily run around the indoor track at the YMCA, I've been pushing Anderson in the BOB jogging stroller. We start right after dropping Mason off at school and cover 3-5 miles. Anderson is usually pretty content while riding in the stroller. I'm sure looking at trees and birds can get boring though so he has started finding other ways of entertaining himself. Yep that's his "lovey" affectionately called Penguin. Original name right? Anyways ... we had just ran a little over 1 mile and I was actually thinking to myself how great the run was feeling. We had been cruising at a good speed and everything seemed lovely, until I looked down into the stroller and couldn't locate Penguin. After coming to a complete stop and looking for Penguin I realized Anderson must've thrown the poor guy overboard at some point during our run. So we had to turn around and head back to our starting point in hopes that I would come across Penguin. 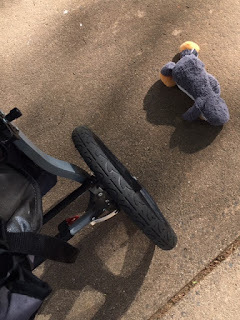 Luckily the stuffed animal was about 1/4 mile away looking pitiful on the sidewalk. We scooped him up and tried to continue our run without any more drama. We managed to do 4 miles before Anderson's Little Gym class. If we do another run together tomorrow I'm pretty sure Penguin will wait for us in the car.